Hillary Clinton is “thinking about” running for president. Here’s some data on female heads-of-state. 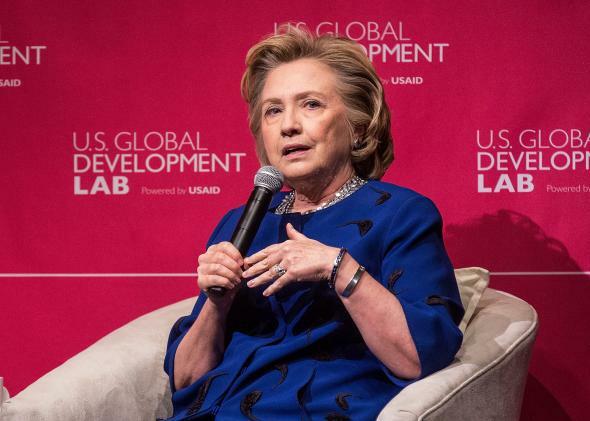 “I am thinking about it,” hedged Hillary Clinton on Tuesday, when asked at a San Francisco marketing summit whether she planned to run for president in 2016. “The hard questions are not do you want to be president, or can you win. The hard questions are why. Why would you want to do this and what can you offer that could make a difference.” Though the thickness and toughness of the star-spangled glass ceiling sometimes makes us forget it, data on female heads-of-state exists: Could looking at it help Clinton figure out what she has to offer? For instance, my colleague Josh Keating has written on whether countries with woman leaders experience less corruption. The answer: It depends. In 2013, a study from political scientists at Rice University upended the conventional wisdom that female government officials always hewed more to the straight-and-narrow. Yes, women avoid dirty dealings in political cultures that stigmatize crookedness: The female stewards of democratic societies, which as a rule tolerate less sketchy behavior than autocracies, tend to keep their hands especially clean. (Keating makes a strong case that this is because their stations are flimsier than men’s and people hold them to higher standards.) But in “countries that rank lowest on the Polity scale”—a measure of democracy—researchers found “little difference in corruption” between the sexes. Apparently, when you disappear the consequences of malfeasance, you also disappear the gender gap. Last December, social science exposed another factoid on female leadership: Nations with a lot of ethnic diversity show stronger economic growth when women are in charge. Susan E. Perkins and Nicolas Pearce from the Kellogg School of Management looked at 139 countries over the span of 55 years. They found that while “ethnic fractionalization” usually correlates negatively with GDP—getting individuals without much in common to cooperate is always a challenge—diverse countries with female heads-of-state had six percent higher growth rates than fragmented societies with men at the helm. And the effect swelled as diversity increased: “In Liberia, one of the most ethnically fractionalized countries we surveyed, the predicted GDP growth was 6.15% under a female leader and 0.69% if the leader was male,” the researchers write. So, regardless of whether the lady president is made of iron or sugar, people from varied walks of life may assume they will be respected. And it could be that women do embrace a more inclusive leadership style. (They may also take fewer risks, prioritize “meaning” or “purpose” over compensation, and display more vulnerability.) Either way, as the global economy veers toward adjectives like “ambiguous” and “interconnected,” heads-of-state will want to develop a more “feminine” touch, the researchers say. A few caveats: The study rests on a small sample size, as only 61 out of the 1,338 leaders examined were women. And while the correlation is suggestive, independent factors may make a country both more likely to succeed economically and to install female politicians. (A culture that taps feminine talent in the private sector, for instance, is probably open to electing a woman in the public sector—and also has a better chance of getting rich.) Hillary Clinton has waaaay more to offer than just her gender, but this research does hint at contexts in which “female” power is an asset, rather than indistinguishable from or a lesser reflection of “male” power: something for all of us, not only Hillary, to think about.